Persistence Market Research (PMR) analyzes the automotive solenoid market in its new publication titled “Automotive Solenoid Market Global Industry Analysis 2013 – 2017 and Forecast 2018 – 2026”. This global study on automotive solenoid provides data for 2017 along with the forecast for the period 2018 – 2026. The main objective of the global automotive solenoid report is to identify the dynamics of the market and provide recent updates and insights that affect the various segments of the global automotive solenoid market. To provide a better understanding of the automotive solenoid market, the report also includes the analysis of global drivers, restraints and trends, which influence the current market scenario and will define the future status of the global automotive solenoid market over the forecast period. PMR’s solution is aligned towards meeting defined objectives, thus helping clients to make informed decisions about the global automotive solenoid market. The research study offers detailed insights and in-depth research on the automotive solenoid market on global as well as regional levels. 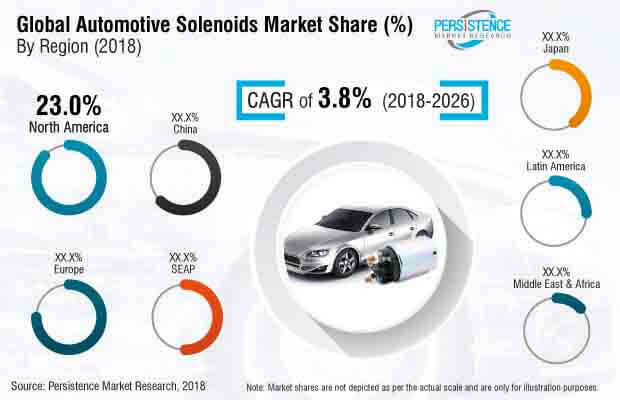 The automotive solenoid market report covers the important factors driving the growth of the market, untapped opportunities for the manufacturers, trends and developments shaping the dynamics of the market and other insights across various key segments. The automotive solenoid market covers diverse sections, such as the Executive summary, Analysis and Forecast, Supply Demand Scenario, Competition Assessment and Research Methodology & Assumptions. We have also analyzed the different segments of the global automotive solenoid market in terms of Basis Point Share (BPS) to understand the relative contribution of every individual segment to market growth. This detailed level of information is important for identifying various key trends governing the global automotive solenoid market. The report also analyzes the global automotive solenoid market on the basis of absolute dollar opportunity. This is usually overlooked while estimating the market forecast; however, from a sales perspective, it is essential to identify the absolute dollar opportunity to identify potential resources in the automotive solenoid market. PMR has developed a market attractiveness index to understand the key segments in terms of their performance and growth in the global automotive solenoid market. This market attractiveness index is expected to help clients identify real market opportunities in the global automotive solenoid market.